Hawks Riverfront cabins a a family owned and operated business between the town of Gilbert & Man WV. Mike & Christina Hawks along with there son Micah want to make your stay the most memorable and home felt experience possible. 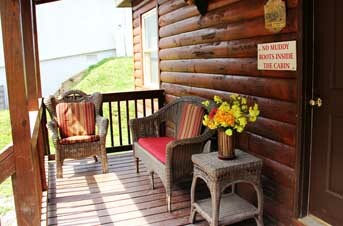 The cabins offer all the comforts of home, such as heating and air conditioning, fully equipped kitchen and full bath. We provide all linens needed. 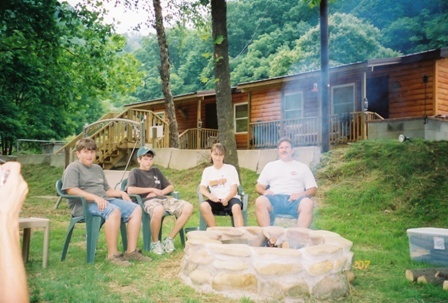 Each cabin has a porch with access to the river, its own charcoal grill, Gas Grill and fire pit. Limited firewood available. 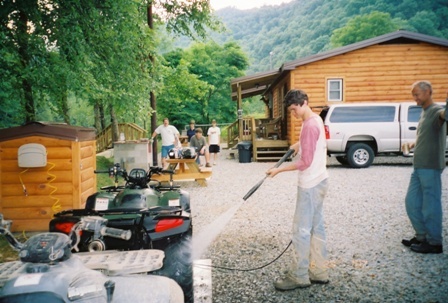 Power wash station with air compressor. Large amount of parking for truck and trailers. You never know, after staying here you may not ever want to leave "Wild and Wonderful West Virginia!" 2004 - Hawks Riverfront Cabins was established. 2009 -The great flood of Gilbert WV. 2009 -Built flood wall and repaired cabins. 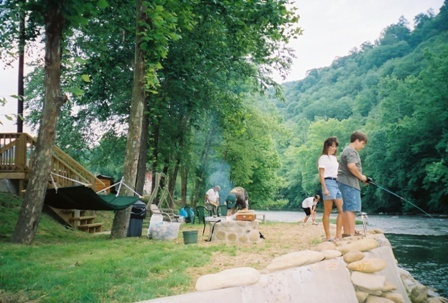 2010 -Build riverside peer, Introduced Fire pits, Fishing & river Tubing. 2011 -New Grizzly Cabin built and open for business. 2015 - Re-modeled Bear Cabin. Looking Good! Don't just take what we say about our cabins Read what our customers have to say!. All Cabins have testimonial books and we encourage you to fill them out. Below are real testimonials from real Hawks Riverfront Cabins customers. Oct. 14th - 19th 2015: Mr. and Mrs. Haynes from Syracuse N.Y. had an awesome stay here at Hawks Riverfront Cabins. We will definitely return to stay with Mike and Chris. We never met Chris, but Mike and his son Micah are good people. Sept. 25th 2015: Denny, John and Jimmy. Ohio. Thanks Mike and Chris. Love the cabin. Great hospitality. Nice hard working man. We will be back for sure. Dec. 31st 2015: Thank you all for a wonderful time. Been coming for 8 years, and you know we have always looked forward to coming here. There is always a story and thank you for everything, Chris Red and J.W, Roger and Janet, Uniontown P.A. Jan 10, 2016: My husband comes here once a year and wanted to share the experience with me. Now I know why! The quiet, the beautiful setting, and in my husband's case, the trails, and I love the cabin. All the finishing touches adds to the relaxing atmosphere... Now he'll have to bring me back here, with gratitude, Lynda and Rob Alton, Brantford Ontario.